In this chapter will be discussed the methods of painting a flat figure using enamels, acrylics and gouaches. I must confess that I don’t have a lot of experience from these 3 mediums. So only a brief discussion will take place. For more information about each method I will point out the appropriate reading. Starting with enamels, there are a lot of resemblances with oils but there is a big difference. While oils need hours or even days to cure so they are still workable, enamels have a much shorter drying time, making things a bit more difficult. When painting with enamels never use the paint straight from the little tin jar. Instead, take a small quantity of paint from the bottom of the jar to your palette and add 1-2 drops of thinner to make a workable mix. It is recommended to use the specific thinner each brand has for its colors. When the new mix is ready and homogenous apply one or two thin coats of the base coat to the figure and let it thoroughly dry. Next day, prepare a shadow mix from the base coat plus the darker tones appropriate from each color. Its very important to make this mixture very diluted and apply it in all the areas that will be in shadow, folds, creases and so on. If paint is not diluted enough you will end up painting dark brash strokes which is not what we are after. Dip the tip of the brush into white spirit and whip it of onto a tissue paper and blend the edges of the shadow color and base coat to get a smooth transition between colors. You may need to do this step more than once, in small increments so you get the shadow color gradually. When this is dried make a light mixture from the base color plus some lighter tones appropriate for each color you paint and apply them thinned onto the areas that will be highlighted. Do the above technique to smooth the borders of the base color and the highlights. Now the figure has its base color, shadow and high lights applied. You may need to repeat the shadow and highlight steps for more contrast between shadows and lights. Don’t underestimate any painting medium. Many people think that oils is the only paint that should be used if an artistic result is what is after. This not true. 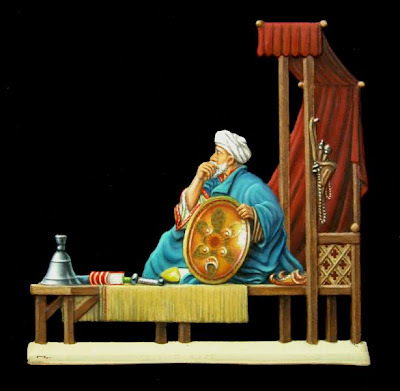 Bill Horan, Mike Blank or Dough Cohen use enamels exclusively on their round figures with spectacular results. For specific techniques about enamels I strongly recommend Bill Horan’s or Mike Blank’s books. See Appendix 2. Gouache is the next examined color of this chapter. It’s a not very known painting medium used mainly by the advertisement business. I have never used it, nor I have seen how it looks like at the shops. I have seen painted examples of flat figures though, that are really amazing at the same level with figures painted with oils or other mediums. For this I will include a very informative article written by a member of British Flat Figure Society, Simon Hoggett, of which I am a member also. 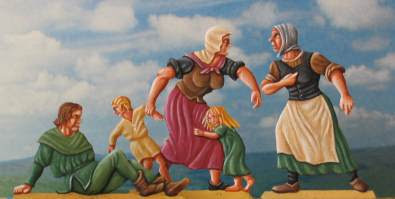 It is generally accepted that you paint flat figures in oil paints. Well, that’s all very well but what happens if you can’t paint with oils to save your life? This article will look at one possible alternative that you might not have considered – Designers Gouache Oil paint! I never could get to grips with the horrible stuff, despite studying art to A level standard at school and later doing graphic design at university. Whatever it was that you needed to be able to achieve success with the medium, I just didn’t have it! Perhaps it was my lack of patience. Maybe it was the fact that I never knew when to stop fiddling, until the whole lot blended into a uniform brown colour. Of course, if I’d restricted myself to painting figures of female mud wrestlers I could have been a master of the genre. As it was, my efforts looked simply awful. So, the oil paints went in the dustbin, taking a well-deserved place next to the empty tins of cat food and baked beans. I had to find something else. To be honest, when I started modelling it didn’t matter much. I was building Historex kits straight out of the packet, armed only with a blunt craft knife and a tube of glue. Not for me the finely customised masterpieces of Bill Ottinger or Shep Paine. Most of mine looked like extras in Dawn of the Dead. As for painting, a quick coat of Humbrol usually did the trick, plus a few rash experiments with acrylics with invariably bad results. The family yawned with indifference which I happily mistook for stunned admiration. Ah, those were the days! But then I discovered flat figures, or re-discovered them really because I had a small collection from my childhood. At that time, my aunt, who was quite a catch on account of the fact that she ran a pub, was energetically courted by the dubious owner of the local militaria shop. As part of his valiant campaign to win her hand in marriage he showered her favourite nephew (me, of course) with gifts of flat soldiers and military books. Unfortunately, she dumped him in favour of her life-long love affair with gin and cigarettes. He sold up and disappeared without trace, broken hearted but no doubt consoled by a fair chunk of her savings. 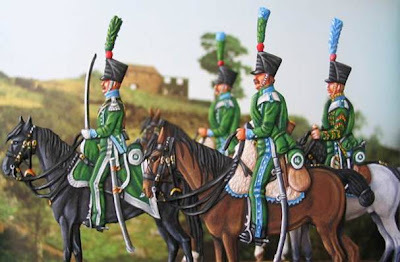 French Line Chasseurs from Glorious Empires painted in gouache by Simmon Hoggett. gained a reasonable competence with the stuff. 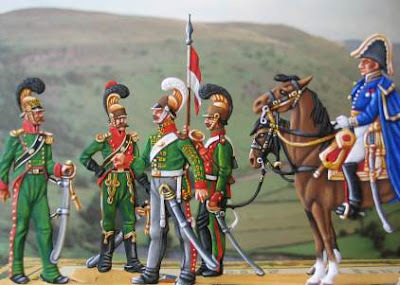 Above: French Line Lancers by Thiel painted in designers gouache by Simon Hoggett. This is not an article on how to paint flats. This isn’t the place for learned thoughts about chiaroscuro, directional and reflected light sources, trompe l’oeil effects etc. I will leave that to other more skilled exponents. But I thought I’d share some of my experiences with gouache. A few slightly different techniques are needed to gain a level of success. As with all flats, the first thing to do is get rid of all the flash on the shiny metal figure and cut off any extra limbs on ‘combination figures’. Some flats have more arms than a Hindu god, which allows you to create several different figures from the same master. Pure genius isn’t it? The cleaning up should be done with a sharp knife and some mouse-tail files. I would also advise having a damp cloth and a glass of brandy close by. The cloth is for wiping up the blood when you plunge the knife in your hand and the brandy is, of course, for purely medicinal purposes. Many flats painters will tell you not to worry unduly about minor pitting in the surface of the figure because the paint will fill it. Well, oil paint might but gouache won’t, so you need to make sure they’re filled. The figure then needs undercoating. There are several options here. You can spray it with Car Primer but if you don’t shake the can well, it comes out like all blotchy like fake snow. This is not an ideal starting point, so shake it until your arm drops off and you have a migraine from listening to the ball-bearing rattling around inside. I recommend that you spray the figure outside in the garden and particularly suggest that you void using it on the dining room table because the paint is a devil to get off the polished wood and all the inhaled fumes make you fall over a lot. Not that I’ve tried this, you understand. Honest! A flat-collecting colleague recently said “but surely they aren’t waterproof?” Well, true, but this hasn’t been a problem since I stop playing with them in the shower! Seriously though, most collectors mount their figures in frames or box dioramas, or display them in cabinets. So, I don’t think that their failings in the waterproof department is really a problem. Okay, they won’t take rough handling but who’s going to do that anyway? If you really must, you can protect the painted figures by spraying them with a matt varnish. This works well, but it does change some of the colours slightly, which can be pretty irritating so I recommend that you do some tests first. I’m not claiming the gouache is the best paint to use on flats. If you’re getting good results already, then fine. However, if you struggle with oil paints, why not give it a try. It does work. Well, you can judge for yourselves, from the pictures with this article. Okay, so I’m no Michael Taylor or Ken Pipe but I have achieved a standard that I’m happy with." Acrylics is another option someone has to consider. They have become a trend lately by the Spanish school of artists and many people use them exclusively for their work. When you get the feel of it, it can become a tremendously artistic medium producing amazing results. Since I never seriously used them in any other way other than undercoating (although I tried a couple of times), I will include an excellent article of Mario Fuentes in this chapter explaining how you can get amazing results using this type of painting medium. Although the article is written with round figures as examples, same techniques apply to our flat figures with minor modifications due to scale or the obvious difference of three dimensionality. Napoleonic Officers. 54 mm flat figures from Glorious Empires painted in acrylics.